BADGER — Joan Renee Hovey, 89, of Badger, passed away on Thursday, February 7, 2019, at Friendship Haven in Fort Dodge. Vis­itation will be from 1:00 p.m. to 2:00 p.m. on Thursday, February 14, 2019, at Gunderson’s Funeral Home, with the funeral service immediately following there at 2:00 p.m. Burial will take place at Hovey Cemetery. 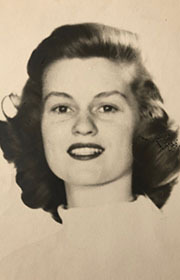 Joan was born on August 22, 1929, in Fort Dodge to Charles and Dolores (West) Eslinger. She attended Fort Dodge Senior High and Fort Dodge Junior College, where she majored in psychology. Joan was united in marriage to Eldon Hovey of Badger on August 9, 1952. The Korean war had already begun, and she accompanied Eldon, an officer in the U.S. Air Force, to Lackland Air Force Base in Texas and then to Westland Air Force Base in Massachusetts. After the war, Joan and Eldon settled on the Hovey family farm. Joan first worked for her father, who managed a shoe store in Fort Dodge. In her twenties, she worked in ladies wear and modeled for Younkers. Later she owned and managed the Cheese Wedge, a gourmet cheese shop in the Emporium in Okoboji for three years and then grew herbs and sold them at the farmers market in Spirit Lake. She loved horses and rode, raised, and showed them in her teens through thirties. Joan was a mother with a capital M and she believed that life was to be celebrated by enjoying time with family and friends. She was happily married for sixty-five years and loved to entertain on the farm and in their homes in Spirit Lake and Mesa, Arizona, and will be remembered by many for her chocolate chip cookies. Joan was active in her community. She started the Brownies troop in Badger and was also a Girl Scout leader, as well as a Cub Scout den mother. She was a PTA president for Badger Elementary and a Circle leader, Sunday school teacher, and advisor for the Luther League at Badger Lutheran Church. She was on the Webster County Extension Women’s Committee and was a longtime member of the Ingleside Club. She is survived by her son, Erick (Betsy) Hovey of Fort Dodge, daughter, Susan (Ian) Webster of Chicago, and grandsons, Charles and John Webster. Also by her cousin Earlita (Bruce) Kahler; her sisters-in-law, June (Robert) Johanson of Kansas City and Janice (Don) Messerly of Shoreview, Minnesota; and brother-in-law Tom (Sandy) Hovey of Badger. She is preceded in death by her parents; husband, Eldon; daughter and son-in-law, Julie and Arnie Bode; and brother-in-law Don Messerly.